Plant-derived recombinant proteins provide alternatives to proteins produced by mammalian, microbial, and insect cell cultures due to significant upstream technological achievements over the past 5–10 years. Plants offer flexibility in both growth methods (open-field, greenhouse, and bioreactor) and host expression systems (seeds, leaves, and cell culture). The diversity of plant production systems provides for numerous commercial applications of plant-derived recombinant proteins but economic viability must be ensured through high expression levels and scalable manufacturing processes. Initial research efforts in plant biotechnology were focused on expression strategies and, thus, upstream production achievements have not be matched by downstream processing advancements. However, case-by-case extraction studies for numerous recombinant proteins led to the development of plant system-based approaches. Other progress includes the development of pretreatment strategies to improve purification efficiency and to reduce downstream processing costs for purification from green tissue homogenates that contain chlorophyll, phenolics, and active enzymes. 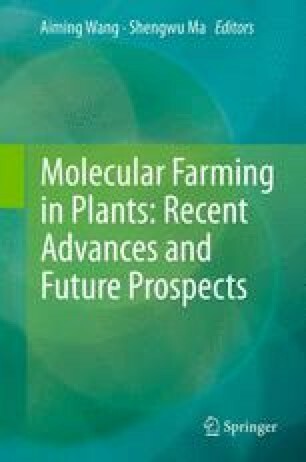 In spite of all the progress and positive developments made in the last 10 years, continual research and technological breakthroughs in downstream processing are needed to capitalize on the lower production cost of transgenic biomass. This chapter describes general advantages and disadvantages of seed-, leaf-, and bioreactor-based plant systems and strategies used for primary recovery and purification of recombinant proteins. The authors thank Ms. Georgia Barros of Texas A&M University and Dr. Susan Woodard of Caliber Biotherapeutics for preparation of the chromatograms cited in this chapter as unpublished work.